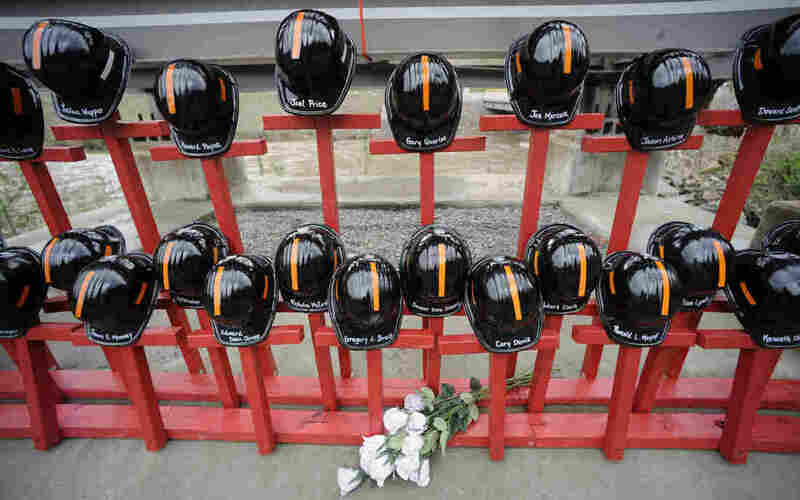 Doctors Confirm Black Lung In Victims Of Mine Blast : Shots - Health News A study of mine blast victims finds further evidence that there's a resurgence of black lung among coal miners. The relatively young ages of some of the miners and their limited tenure underground suggests significant exposure to coal dust. On Monday, a team of pathologists and lung disease experts will present the results of a detailed study of lung tissue from some of the victims of the Upper Big Branch mine disaster in West Virginia. They'll describe the findings at the American Thoracic Society's annual conference in Philadelphia this weekend. "Our pathology — where we actually see the lung tissue, we actually see the scars, we see the dust — confirms we're seeing a problem," says Robert Cohen, the lead researcher and chairman of pulmonary and critical care medicine at Cook County Health and Hospitals System in Illinois. Cohen's team reviewed lung tissue obtained from autopsies of seven of the Upper Big Branch victims. Only seven families of the deceased coal miners granted permission for the study. Six of the seven samples bore telltale scarring that indicates black lung. One of the samples showed a "fairly advanced form of the disease." One of the miners worked for less than five years underground, and several had worked about 10 years in coal mines. They ranged in age from about 30 to 60. The names and specific information about the miners weren't disclosed because their families were promised confidentiality. Cohen says the relatively young ages of some of the miners and limited tenure underground "means that there were probably some intense exposures and excessive exposures over a short period of time. That raises some concerns." Extraordinarily high rates of black lung in the Upper Big Branch victims were first found during autopsies just after the explosion. The West Virginia medical examiner told mine disaster investigators that 24 of the victims had sufficient lung tissue for testing. He concluded that 71 percent had black lung, a rate 10 times the average for southern West Virginia. There is a problem in our control of our exposure to dust that's causing worsening disease and resurgent disease. At the time, investigator Davitt McAteer, a former federal mine safety chief, said the autopsy results were shocking because of "the number of miners who showed evidence of black lung, particularly among younger miners and miners who you would not have expected to have black lung." McAteer asked Cohen to assemble a team of experts to examine the lung tissue of as many victims as possible. Cohen acknowledges that the sample size is limited. "It's a small number of miners," Cohen says. "But the miners who were referred to the study were a random sample — people who just happened to be working in that mine that day who were killed in the disaster." Several investigations of the disaster concluded that mine owner Massey Energy had permitted dangerous accumulations of coal dust in the mine. That may explain the high rate of black lung in the tested lung samples of victims. "Mines that tend to have accidents do tend to be less clean than mines that don't have accidents," Cohen says. But Upper Big Branch "may be representative of a number of mines in the United States today," he says. Cohen also says the tissue analysis "adds supportive information" in the wake of a number of studies documenting a resurgence of black lung in portions of Appalachia, onset of the disease among younger miners and more rapid progression to advanced stages of disease. Cohen and another group of researchers summarized those studies in a report last month in the American Journal of Respiratory and Critical Care Medicine. That report, Cohen says, tackles "ancient legendary teachings" about black lung that have led to misdiagnoses and rejection of claims for black lung benefits payments. "Contemporary medical school training and residency training and even fellowship training hasn't really kept up with the latest research and science in coal-mine dust lung diseases," Cohen contends. "Many pulmonary physicians were diagnosing miners with lots of exposure to coal dust as having disease as unknown cause," he adds. The report says many physicians erroneously believe that only round scars on lung tissue, and only scars in upper lobes, are signs of black lung. "That's not true," Cohen says. The disease "can cause irregular scars or linear scars all over the lungs." The report urges more frequent X-rays and lung function tests for coal miners. It also urges physicians to "take exposure histories" for coal miners, including the jobs they performed, the machinery they operated, the kind of mines that employed them and how long they worked. A spokeswoman for the National Mining Association, a trade group, responded narrowly to the report, noting the group's support for mandatory X-ray testing of coal miners. The testing is voluntary now. "This would provide miners and mine operators the information required to take corrective actions where miners are found to suffer from lung disease," says NMA spokeswoman Nancy Gravatt. Federal law gives miners the right to seek reassignment to jobs with less coal dust exposure when they have indications of disease, but miners' advocates worry that mandatory testing will give coal companies the ability to dismiss workers with signs of black lung. Cohen says the lung tissue testing of the Upper Big Branch victims and the new report for physicians confirm "that there is a problem in our control of our exposure to dust that's causing worsening disease and resurgent disease." The federal Mine Safety and Health Administration said in 2010 that tougher coal-mine dust exposure limits are a top priority. Congressional Republicans delayed action on new limits until the Government Accountability Office could complete a study. The GAO study was issued last August, and it supported MSHA's efforts. The agency set a target date for next month for rule-making on its proposal, but it's unclear whether that deadline will be met. MSHA spokeswoman Amy Louviere says, "I have no new information about the dust rule." Black lung has killed 70,000 coal miners since 1970. NPR, the Center for Public Integrity and The Charleston (W.Va.) Gazette documented widespread industry cheating in the coal-dust control system and weak federal regulation in a series of stories last year. "These results are beyond disturbing," says Wes Addington, an attorney at the Appalachian Citizens' Law Center, which represents coal miners seeking black lung benefits. "I don't care how small the sample," Addington adds. "To find black lung in 85 percent of these miners shouldn't be happening in this country." Coincidentally, the National Institute of Occupational Safety and Health has just published a study in the American Journal of Public Health that assesses the accuracy of its black lung data documenting the resurgence of the disease in Appalachia. Industry critics were concerned that researchers tested miners who already had symptoms. But the NIOSH review found that healthy miners with no X-ray indications of black lung participated in the NIOSH screening and returned for additional testing even when they had no symptoms. The NIOSH study reviewed its reporting for bias and concludes that it is "broadly accurate, although the data likely underestimated the national prevalence of [Coal Workers Pneumoconiosis]," the formal label for black lung. The undercount, the researchers say, is likely due to the fact that the surveillance system is limited by federal mandate to working coal miners and does not include those who have retired. Black lung is progressive and retired miners may still develop symptoms and advanced disease. The report also reviewed NIOSH data on other possible causes of lung disease suffered by coal miners and found the "increasing prevalence of pneumoconiosis among coal miners could only be attributed to inhalation of unsafe amounts of coal mine dusts, and could not be attributed to age, smoking, other diseases, or background radiographic abnormalities." NIOSH concludes the study by urging MSHA to adopt its proposed new standard for coal mine dust exposure, which NIOSH first recommended in 1995.